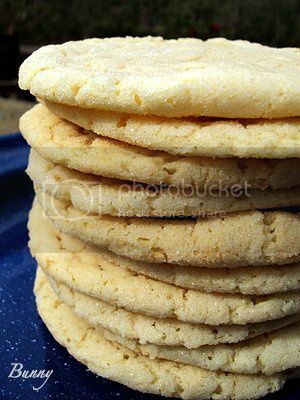 Bunny's Warm Oven: Absolutely The Best Sugar Cookie Recipe EVER! Absolutely The Best Sugar Cookie Recipe EVER! I love living in Kentucky. The people here are amazing. To Read More, Click On The Recipe Title. When I first got here, whenever my husband and I would get in the truck to run errands I noticed that every car that passed us would wave to us. I commented to Paul that he must know everybody around here. He said , why do you think that? I said, cause every car that passes us waves at you. He said, they'll wave at you whether they know you or not, it's just what they do here. I was amazed, totally amazed. Every person , man or woman young or old that I was introduced to shook my hand and asked me how I liked living here. It honestly made me feel right at home. I made these cookies to give to our neighbor Randy who brought his tiller down here to help us start our first garden. I hope he gets these soon cause if they stay in this house any longer I'll have to make another batch ! OH my these are good! I absolutely love slightly crispy chewy cookies, I've never been nor ever will be a cakey cookie girl. I saw these on Heather's blog, Southern Pink Lemonade.and decided they needed to be made. I followed the recipe exactly. The recipe is suppose to make 24 cookies , mine only yielded about 20. But I'm pretty sure that my 2 tablespoons of cookie dough kinda grew as I went alone....opps! 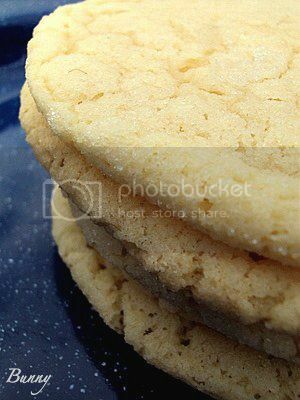 This recipe gave me BIG round thin soft and chewy sugar cookies, like bakery size cookies. The cookies spread quite a bit. But see I wouldn't change that cause I loved it. You might want to go down to 1 tablespoon of cookie dough with less baking time, or refrigerate your dough so they don't spread as much. I adore them just the way they are. I was thinking how great these would be to make ice cream sandwiches with! I'm already thinking of ways to cool off in the summer! Enjoy! Preheat oven to 350 degrees F. Line a cookie sheet with parchment paper or a silicon baking mat. In a small bowl, sift together flour, baking powder, baking soda, and salt. Set aside. In a medium bowl, measure out the sugar. Place the cream cheese on top and pour the melted, warm butter over the top. Whisk to combine. There will be a few lumps of cream cheese remaining but they will mix in completely in a few steps. Whisk in the oil until fully combined. Stir in the egg, vanilla, and milk. Add the flour mixture and fold in with a spatula until a smooth dough forms. Roll 2 tablespoons of dough into 24 balls. Roll each ball into the extra sugar. Place the cookies on the prepared baking sheet (I could only fit 9 at a time). Using the bottom of a flat drinking glass, slightly flatten each cookie until they are 2 inches in diameter. Bake for 11-13 minutes, turning the pan halfway through baking. Let them cool on the baking sheet for 2-3 minutes before removing to a wire rack to finish cooling. At work I talk to a sister company in Paducah almost every day. I have to say, they are really the friendliest people around. This recipe sounds delish. Sometimes simple is good! There's nothing like really perfect, classic sugar cookies and yours look just delicious, Bunny. I liked your impression of the friendliness of folks in Kentucky. My college-freshman son just came home from a car trip down to North Carolina and he said to me today, "It just seems like people are friendlier there than they are up north. Everyone waves to you or says 'hi' even though they didn't know you!" I thought it was neat that he was experiencing that for the first time. It does seem to be one of the nicest characteristics of some of more southern states, doesn't it? I'll bet your neighbor will love the cookies! Lisa my husband who "says" he doesn't eat alot of sweets ate 4 of these. He said...,when you get them in your mouth you just want them to stay there. I'd love to figure out how to make them chocolate! Jane, living here has been wonderful and I'm happy your son experienced it too. Deb, you can email me anytime your little heart desires! My absence at times is because I haven't had a full size oven until now. And there's only so much you can do with a toaster oven! LOL My husband is expanding the kitchen and doing the work himself. We finally bought a commercial oven and got that baby cranked up!! LOL!! It looks like you make wonderful stuff here....I will be trying many of them at some point in time. Thanks for sharing all of this good homemade food. My brother moved to Nashville 3 or 4 years ago and says the same thing about people there....all very friendly....pretty cool! those look like they'd just melt right on your tongue. keeper recipe, for sure! It would take a while to get used to that kind of friendliness. This weekend, we were 30 minutes outside of the city and the car driving by us waved. It was so quaint. The sugar cookies look delicious. I haven't made any sugar cookies since the hundreds my mom and I made for my wedding. Maybe I need to find an excuse to try this recipe out. These cookies look delicious and I can't wait to have an excuse to try out this recipe.. That being said, I've been a Kentuckian my entire life and I can say in my travels there is nothing like the extreme sweetness you get from Kentucky people! Even our major cities have nice people.. No one seems to be in a hurry to get anywhere.. I think it is a major contributor to the overall relaxed nature of the state! Hi Debbie! Thank you so much, I get a lot of inspiration from my cooking/blogging friends. They are awe inspiring people! Grace, they go down way to easy! LOL!! Katy, they are one good cookie and I'm sure your sweetie pie would love them as much as mine did. Missed you too !! Psychgard, living here is such a welcome change from the little city with the big city problems that I came from. Yes definitely find an excuse to make them, they won't disappoint you. Robert let me know how the work out for you! Anna,thank you! It's a delight to have you aboard! TiffHemphill, your so right! There's such a relaxed feeling here, a "sit down and visit" feeling that's wonderful! I saved this recipe. I can't wait to try them! Hi Mary! I hope you enjoy them! I thought these looked familiar and now I know why. This comes from America's Test Kitchen (Cook's Illustrated), one of my most trusted sources of recipes. I blogged these, and make them fairly often. Yes, they are indeed the ULTIMATE sugar cookie... crunchy on the outside, chewy on the inside. You have me craving them again! Debby no wonder they're so good! I will never have to look for another sugar cookie again! These cookies are delicious. Can you make ahead and freeze? Would love to bake ahead and put them in my Xmas trays for family. Thank you for sharing this delicious recipe...have a great Christmas. Sandi I've never frozen them after I baked them. I know that you can freeze most cookie dough before they're baked. I just don't know about after they're baked. If you try it let me know! I know what you mean about people waving at you...if you are not used to it, it is a little odd at first! We have friends with a boat and the first time they took us out on the lake we thought they knew everyone on the lake because they were all waving at us! I finally asked how they had met all these people and they told me that everyone just waves at everyone else when you are boating. So friendly! These cookies look heavenly, I am so glad I found them! I need to make cookies for my son's class and I am going to use this recipe! 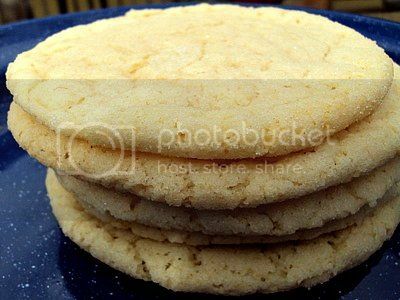 Kristen you will love these, they remind me Pepperidge Farms Sugar Cookies that I absolutely ADORE! These look amazing. Omg. So simple and big. Man I'd love to have those NOW! sourdoughsweetgirl, these are the best sugar cookies I've ever made, they're incredible!